The EcoHitch® hidden hitch for the 2014-2018 Subaru Forester is designed to be completely concealed so you only see the receiver once it's installed rather than having to see a crosstube underneath your vehicle. Rated for 350 pounds tongue weight and 3,500 pounds towing weight, the Subaru Forester EcoHitch has the strength to keep up with any adventure you go on. If you’re going to be towing and need trailer wiring, click here! Ensure your wiring harness does not drag on the ground by visiting our Eclipse trailer wiring bracket page. 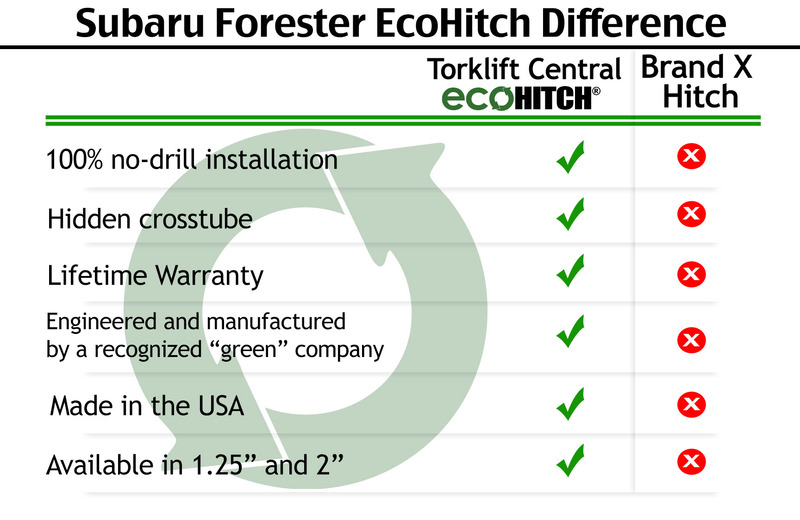 The EcoHitch® hidden hitch for the Subaru Forester comes in both 1.25-inch and 2-inch receiver sizes so you get your choice of which bike racks and cargo trays will work best for the receiver you choose. With 350 pounds tongue weight and 3,500 pounds towing weight capacity, this hitch for Subaru Forester gives you the ability to have a turbocharged ride in your Forester without losing style or craftsmanship since the receiver is only visible when installed. If you have a Forester, then it means you have a need for a little gusto. We have created the perfect Forester hitch that complements the contours of your vehicle to help explore your adventurous side, because who knows where your big list of tasks and priorities will take you. With this Subaru hitch, you can bring your bikes, extra cargo and so much more. x7216 37.5 lbs 43" x 12.5" x 26"
x7217 37.5 lbs 43" x 12.5" x 26"
Hitch also fits the 2014+ Subaru Forester XT model *WARNING* Your vehicle may have a lower tow rating than this trailer hitch. If your vehicle's tow rating is less than the rated towing capacity on your Torklift Central trailer hitch, your trailer hitch capacity is limited to your vehicle's factory rated towing capacity.